The Australian Diabetes Map is the only national map monitoring the prevalence of diabetes in Australia. 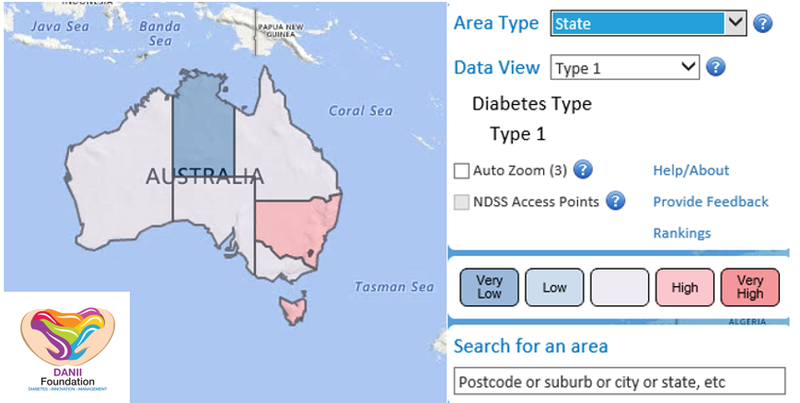 The data contained in the Australian Diabetes Map is derived from the National Diabetes Services Scheme (NDSS) Registrant database* and the Australian Bureau of Statistics (ABS) and shows people diagnosed with diabetes that are registered on the Scheme. The Map uses geo-spatial mapping technology to present population data about Australians diagnosed with diabetes. The map reflects diabetes prevalence rates at a national, federal, state electorate, local government, primary health network, and postcode level based on NDSS data and ABS 2012-2101 population projections. It shows the numbers of people diagnosed with diabetes in all parts of Australia with information on age, gender, type of diabetes, ATSI status and socio-economic disadvantage. The Australian Diabetes Map is a dynamic reference tool for the whole community, our healthcare professionals, policy makers and researchers to help bring a better understanding of diabetes.